This week, however, we opened our first branch office, in Phoenix. Mimi Diaz, a geologist formerly with the Arizona Division of Emergency Management, is now serving as our Phoenix manager. She is housed at the Arizona Dept of Mines and Mineral Resources at 1502 W. Washington (in the Mining & Mineral Museum). This is one of the most important results of the renewed cooperation between our two state agencies and a particularly generous arrangement. DMMR Director Dr. Madan Singh has been unselfish in accommodating our office needs. Mimi will be focusing primarily on natural hazards, especially earth fissures, and groundwater resources. We expect this office to grow in the coming years to better meet the needs of state and local agencies and of the public in this large and rapidly growing market. Arizona’s raw non-fuel minerals (i.e., excluding fuel minerals such as coal and uranium) were valued last year at $6,710,000, equal to 10.42% of all the non-fuel minerals produced in the U.S. The major minerals in Arizona were copper, molybdenum concentrates, sand and gravel (construction), cement (portland), lime. The value of copper production was up 97% over 2005, and is largely responsible for pushing Arizona ahead of recent leader Nevada. Nevada was second at $5,240,000 (8.14% of the total U.S. production), but their leading mineral is gold, which rose a still robust 68%. Interestingly, the U.S. imported 40% of our copper needs last year. Combined with China’s announcement that they will build their copper reserves over the next 4 years along with other key minerals, indicates that global demand for copper will remain strong. This is likely to stoke continued exploration and development activity across Arizona. Geologist and former Presidential Science Advisor Dr. Frank Press told a wonderful story the other night about President Jimmy Carter. We were gathered at the stately Cosmos Club (founded by John Wesley Powell) near DuPont Circle in Washington DC for the annual Pick and Gavel awards ceremony. 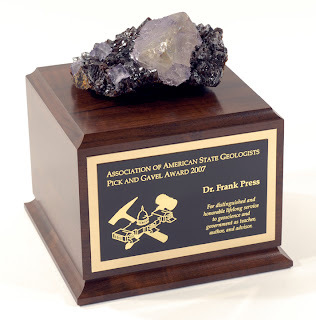 The Pick and Gavel award (http://www.stategeologists.org/pick.html) is given by the Association of American State Geologists (of which Arizona is a member) to recognize significant contributions to the geosciences in the public policy arena. The event has become one for the entire DC geoscience community to come together in celebration. The Pick and Gavel award itself is always a unique mineral specimen, typically valued at many thousands of dollars mounted on a wooden base. Well, in accepting the award, Frank talked warmly about the relationship that developed between him and his boss, Jimmy Carter, who Frank characterizes as the most scientifically literate president since Thomas Jefferson. The Congressional field hearing in Tucson on Feb 24 chaired by US Rep. Raul Grijalva is viewed by the nation’s mining industry as the opening salvo in a full fledged “attack” on the 1872 Mining Law. Mr. Grijalva chairs the House Natural Resources Subcommittee on Parks and Public Lands. In the hearing, he announced his opposition to proposed Rosemont copper mining activities on Forest Service lands and concerns over the Mining Law. In a meeting with the leadership of the National Mining Association in DC last Tuesday, they told us that the chair of the Natural Resources Committee, Rep. Nick Rahall of WV, plans to have hearings on the Mining Law in May and draft reform legislation by June with intent to pass the bill this year. NMA says they are open to certain reforms, aimed at clarifying and expediting the permitting process, but that the core elements of the Mining Law such as continued access to public lands must be continued. When asked if they could go along with a royalty on production, they argue that they already pay a higher lease fee than the oil and gas industry pays on public lands, and that the proposal of 8% on gross production is intended not so much as a revenue raiser as a punitive measure to halt mining altogether. All in all, this appears to shaping up as one heck of a fight. Last week I was in Washington DC with a number of other State Geologists on our semi-annual rounds of meetings with federal agencies, congressional committees, and NGO’s to find out what is happening that will affect the geoscience profession and our individual states. It’s also a chance to offer input on legislation and the appropriations process which is in full swing now. One thing we heard repeatedly is that it’s “all climate change, all the time,” as a senior official in the White House Office of Science and Technology Policy told our group. He said the arguments about the validity of climate change are over and the focus is on what to do about it. In addition, Kraig Naasz, president of the National Mining Association, told us that climate change now appears to be at the top of the domestic policy agenda of the new Congress. NMA members include many of the nation’s largest coal mines, which goes principally to burn in power plants for electricity. About 51% of US electricity comes from burning coal and thus is a major source of CO2 emissions. Capturing the CO2 from the power plant smokestacks and separating it out from the other flue gases could be challenging and costly. Then there’s the problem of what to do with all that CO2 once you capture it. 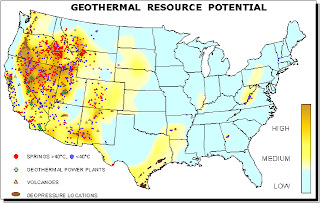 The leading solution is thought to be geologic sequestration – permanently burying the CO2 in deep geologic units, most likely by pumping it down well bores into porous sedimentary layers. There are a number of test projects underway in the US and internationally to assess the technical challenges and costs in doing this at a large scale. Plus there is the question of whether the CO2 will stay trapped underground or leak back into the atmosphere. Answers to these questions will have a profound effect on the electric power industry and thus the coal industry. 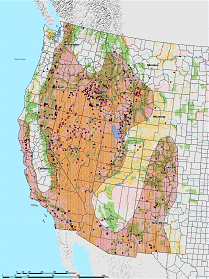 A couple of years ago, AZGS participated in one of seven regional partnerships among geological organizations across the country to gather subsurface geologic information into digital database to identify the testbed targets for CO2 sequestration projects. While Arizona was not chosen for one of the pilot projects, I expect that in the near future, we will be looking closely at the geology in the areas around our existing coal-fired power plants for plausible disposal sites of their CO2 emissions. Geological sequestration is widely talked about as the likely best method to deal with CO2 disposal so expect to see geologists playing a larger role in what has become the hot topic (pun intended) in the Capitol. summaries of hearings and other actions. The National Resource Report on “Colorado River Basin Water Management” issued last week got national attention. So, we have over-estimated the amount of Colorado River water we should expect long term, and under-estimated the severity of droughts. This is going to put more pressure on the state’s ground water supplies which are already being rapidly mined. It also will lead to more subsidence and earth fissures.